The Rum Diary feels kind of tame when compared to Thompson's other work, but tameness aside the film still feels like its struggling trying to find a point. 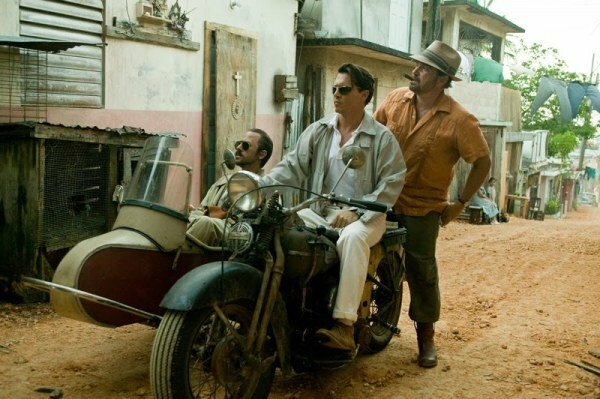 Johnny Depp re-teams with some Hunter S. Thompson material for The Rum Diary; a film that’s not as crazy as their last pairing in Fear and Loathing in Las Vegas, but it’s still a mildly entertaining change of pace for both Depp and Thompson. It’s entertaining because of its actors, but it fails because of its weak focus. It’s one part an alcohol induced trip, full of shenanigans and mishap and another part sculpting of a writer and how he fits into this world. Paul Kemp (Johnny Depp) goes down to Puerto Rico looking for a journalist job. He’s not exactly sure what he wants when he accepts the position from Lotterman (Richard Jenkins), but he does it for the experience. His first order of business is to get liquored up, which makes his new-found friend Sala (Michael Rispoli) all the more important. The two drink rum like it’s going out of style while Kemp mixes and mingles with big shot businessman Sanderson (Aaron Eckhart) and his smokin’ hot fiancé Chenault (Amber Heard). If the booze and women don’t kill Kemp then the dirty and smelly Moberg (Giovanni Ribisi) will with his hallucinogenic drugs and 470 proof alcohol. The Rum Diary is Depp’s tribute to the late Hunter S. Thompson and having not read the source material I can only guess as to how close the film parallels the book. As its own film The Rum Diary feels kind of tame when compared to Thompson’s other work, but tameness aside the film still feels like its struggling trying to find a point. It spends a lot of time focusing on the crazy situations Kemp gets himself into, but towards the final 25 minutes it tenses up and goes in the direction of a drama about a man discovering himself in a world of bastards. Both sections of the film play out fine, but they would have been much better if the film stuck with one or the other. The sweat-soaked Puerto Rico is captured flawlessly in 1080p thanks to Sony. The disc looks unbelievably sharp and clear. The hot, sticky and often-times dirty landscape pops out of the screen. Sure, the beautiful beaches and resorts are eye-candy, but it’s the grimy apartment and worn down streets that really shine on this Blu-Ray disc. There’s a soft layer of grain that blankets the film, but it feels 100% intentional. The 5.1 DTS-HD Master Audio track is strong with much distributed depth and noise throughout. The film is dialogue-heavy, but that doesn’t keep the back channels from actively engaging the ears whenever music comes into the film. There are several scenes that feature lots of cross-talk and the audio track does a great job replicating that. Crowded streets and loud parties have no problem attracting your attention to all of the audio channels. There are only 2 main special features on the disc; the first one comes with a lot of heart and the second one provides a detailed look at Hunter S. Thompson and his novel The Rum Diary. 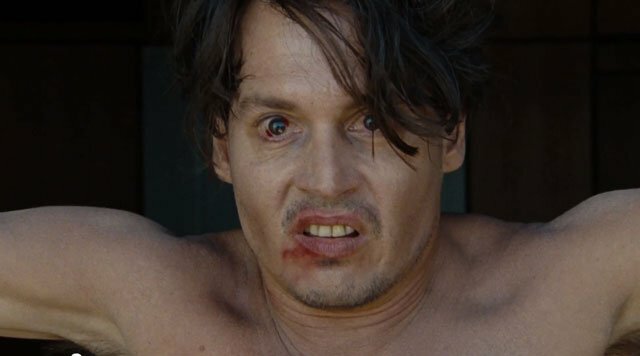 I was a little disappointed with The Rum Diary when I first saw it in theaters and that’s mainly because I was expecting something more along the lines of Fear and Loathing in Las Vegas. My second viewing of the film on Blu-Ray helped me ease back my expectations and enjoy it a little more, but I still felt disappointed with what was presented. The performances by Depp, Rispoli and Ribisi are great, but Eckhart and Heard’s characters feel weightless and the story doesn’t really establish a direction until the final act. It still makes for an entertaining viewing because it’s rare to see Depp actually caring for a role as much as this one. You can tell it means a lot to him and that does help make the film a little better. The disc looks and sounds great, but it’s closed out with only 2 special features. They’re decent sized features, but the disc feels a little dry. I wouldn’t rush out to purchase this film by any means, but it’s something you should check out whenever you have a free minute.